Rachael joined the VCU RRTC team as an employment Specialist in November, 2010. She received a Bachelor of Science in Psychology from VCU. She has direct service and administrative experience in the supported employment field. Her caseload consists of primarily Virginia Department of Rehabilitative Services. Rachael earned ACRE-certification through the supported employment web-based certificate series in 2011. 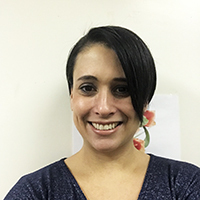 Rachael was recently promoted to Business Connections Program Manager. Mrs. Rounds holds a Master's Degree in Rehabilitation Counseling.